For sometime we have been having arguments regarding email marketing. Many reported email marketing as dead. While some said that it might still work. Like it or not, email marketing is still alive and works wonders. Email marketing still gives you a 3,800% ROI. That means you get $38 with every $1 spent! If this doesn’t convince you about the effectiveness of email marketing then I don’t know what will. But why do you need a mailing list building plugin? You have spent a lot of time crafting the perfect pitch. You have designed the “catchy” subject line. Your efforts will go to waste if you do not have a filtered email list in your pocket. For a successful email marketing campaign on WordPress, we must know the best mailing list plugins. This article covers 6 mailing list building plugins which you should most definitely know about. Love ’em or hate ’em, but you can’t run your email marketing without ‘em! Popups are now an integral part of email marketing. And I am not just saying this, I have facts to back my claim. According to Crazyegg, popups drive 1375% more subscribers. Ninja Popups is a highly customizable plugin. This plugin helps you create effective popups effortlessly. The plugin gives you a variety of popups that are mobile friendly and translatable. Its customizability means that you can create popups for email list building as well as discount offers and other campaigns. Ninja popups also provide statistics so that you can see which popup is performing the best. The built in social locker plugin also increases social count for your website. You can display the same popup design in widgets using the add on plugin. Ninja popups is an all round WordPress mailing list plugin which means that it is definitely going in my list. The name is familiar to many and that is because it is one of the most downloaded WordPress mailing list building plugins. The plugin designs high converting optin forms on your WordPress website so that you can collect emails of your readers. The plugin is user friendly and you can actually create an optin form within minutes and integrate it to your website. You can setup auto responders through Mailchimp so that you don’t have to go through the hassle of replying to emails. Monitoring your email marketing campaign is important and with Mailchimp’s comprehensive analytics report you can easily analyse your efforts. But here’s the best part. With Mailchimp’s free account, you can have 2000 subscribers in your mailing list and can send 12000 emails per month. That will turn some heads. Mailchimp for WordPress’ user friendly interface and simplicity makes it arguably the best mailing list building plugins for WordPress. First thing to mention about this plugin, IT’S FAST! The load time is second to none. The plugin is free and with WP Subscribe you get Aweber, Mailchimp and FeedBurner all under one roof. WP Subscribe is the lightest mailing list building plugins. The plugin has exquisite designs and you can position the forms anywhere on your website. The plugin is fully responsive and you can change text with in the subscription forms; however you cannot change the colors without crunching in some CSS codes. WP Subscribe’s extremely mobile friendly forms is a big plus. The speed and customizability of the plugin are important features and which is why it is going in my top 6 list of mailing list plugins. OptinMonster, launched in 2013, has been with us for quite some time. The email list building plugin is famously known for its clean and attractive designs.The exit intent feature was the reason of its popularity as the feature was a rare sight in that time. The user friendly interface makes it easy for you to create lightbox, slide in forms and footer bars. The plugin shows stats of different forms so that you can analyse your results. It can instantly clone a form for A/B testing as well with its A/B testing module. The plugin is easily integrated with all major Email Marketing Services like Mailchimp, Infusionsoft and GetResponse. The takeaway point however is the page level targeting module. This allows you to display specific and unique offers based on visitor’s location. As the name suggests, the plugin creates optin forms for your website. The installation is as easy as it gets and you can do it in minutes. The plugin comes with great support to handle all your issues. The forms are mobile friendly and fully customizable. The forms are also widget friendly. A simple widget can be added to your sidebar with the help of a widget and a shortcode. Optin Forms allows you to locate your forms where your readers are going to see it. Customizable, simple and easy, all these features means that Optin Forms is up there with the best. SumoMe offers a variety of applications through which you can increase your mailing list. So firstly, there is SumoMe List Builder. 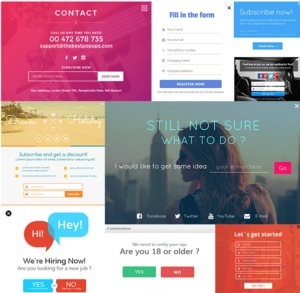 This component allows you to create popups for your website. The Sumo Me Scroll Box is a popup which popus up when the reader has scrolled down a certain percentage of the page. The reason why the popup pops after certain scrolling is that user is more likely to subscribe when it has spent some time on the website. The component allows you to set a percentage as to after how much scrolling should a popup appear. SumoMe Welcome Mat covers the entire page and asks for email address. The user might be irritated by it but it can give pretty good results if used wisely. SumoMe also shows analytics in the WordPress dashboard. The Smart Bar will show on the top of the page asking for your reader’s email address. With a variety of options, SumoMe is without doubt one of the best WordPress mailing list building plugin. As the name suggests, Newsletter is a newsletter system for your WordPress website. It is perfect for mailing-list building, email-tracking and sending. The plugin might not be the most popular, but it certainly is one of the most effective mailing-list building plugins for WordPress. The plugin allows you to create advance popup signup forms in a couple of minutes without necessarily knowing the code. The visual editor allows you to customize the layout of the popups with the instant preview. Another free WordPress mailing-list building plugin is PopupAlly. With only 10,000 active installs, the plugin is rather new. However, it is slowly gaining popularity because of its built-in advanced features and user-friendly interface. The plugin allows you to create advanced popup signup forms in a couple of minutes without necessarily knowing the code. The visual editor allows you to customize the layout of the popups with the instant preview. It’s not only limited to popups. Optin box can also be created through this plugin which can be embedded anywhere on your website. MailOptin grows your email list and customer base by displaying targeted opt-in forms across your WordPress website with popups, slide ins, notification bars, before & after post subscription forms, sidebar widgets and lots more. Never lose customers and subscribers that took you a lot of effort and money to build. MailOptin helps keep them engaged by sending them event-triggered emails. You don’t have to leave WordPress to craft newsletters to your Constant Contact email subscribers. So that concludes my list of top 6 WordPress mailing list building plugins for 2018. Email marketing is still very important for your content marketing and if you’re not taking it seriously, it’s about time that you do. Feel free to share your views on my list and if you have a better one do share that too. The post 9 Top WordPress Mailing List Building Plugins That You Should Know About in 2019 appeared first on WPblog.